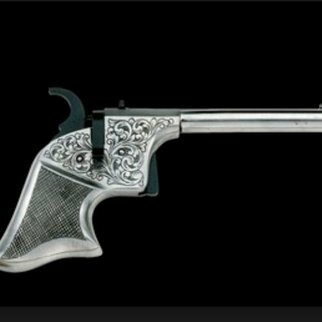 This is a reproduction of the extremely rare Remington Rider¹ Single Shot Derringer pistol of which only about 200 were produced 1860-1863. These small pistols, suitable for indoor practice were called “Parlor Pistols”. 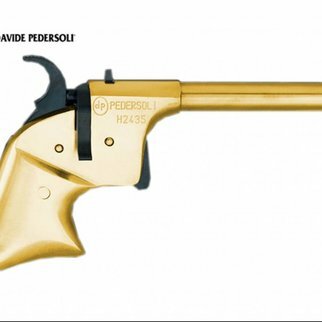 This pistol is of steel construction, available with polished white, case hardened or gold finish. The Deluxe version white finish, has rich scroll engraving. 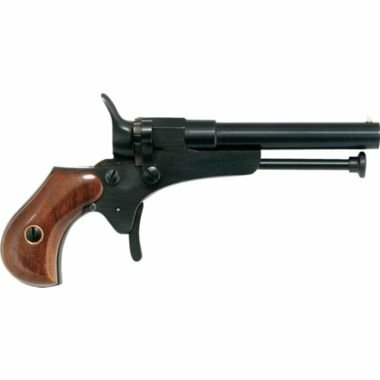 Like the original, this pistol fires a .17 inch (4,3 mm) ball using only a percussion cap and no black powder charge. For short range it is powerful, accurate and fairly quiet, making it suitable for indoor use. A .17" (4,3 mm) lead ball (not compatible with standard ie. 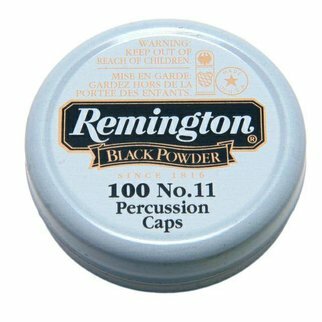 '.177' BBs or pellets) is placed into the breech plug small tube (which is capped) inserted against the barrel. The hammer fires a # 11 cap which expels the ball.